It is very rare for this little weekly feature to get its present before its past, and yet for this comparison I photographed the “now” view of the water end of Pier 70 before I found the “then.” Aboard an Argosy tour boat I prudently recorded everything along the waterfront. That was in 2006 – about. A sign for the law firm Graham and Dunn, the pier’s principal tenant since 2003, shares the west wall with the pier number. Although it is not a perfect match with the “then,” it will do for studying the latest remodel of this big wharf at the foot of Broad Street. 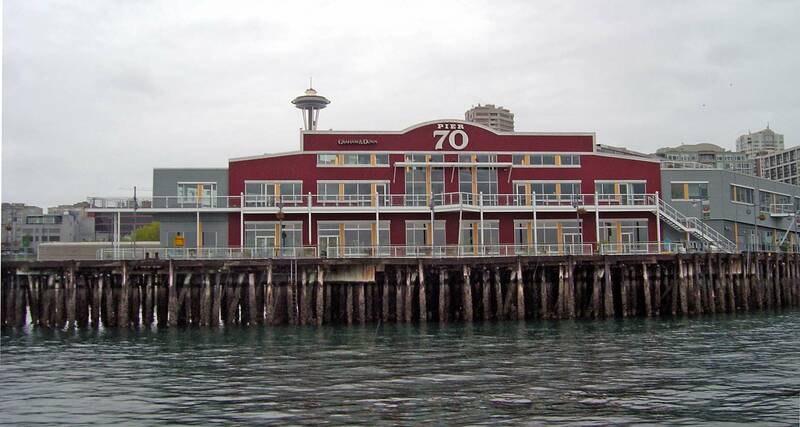 Besides Salmon, through its first 70 years Pier 70 was the Puget Sound port for several steamship companies including the English Blue Funnel and the German Hamburg American lines. Among the imports handled here were cotton, tea, rubber, liquor (It was a warehouse for the state’s Liquor Control Board during Word War 2.) and soybeans. The beans were processed across Alaska Way from Pier 70 in what is now the Old Spaghetti Works, although not for a nutritious gluten free noodle but for glue used in the making of plywood. Joining the general central waterfront tide from work to play, Pier 70 was converted to retail in 1970. Still far from the central waterfront, it was no immediate success. There was then no waterfront trolley, no Sculpture Garden, and, next door, no new Port of Seattle. By now both the Belltown and Seattle Center neighborhoods above the pier are piling high with condo constructions and conversions and the waterfront foot of Broad is quite lively. Until the numbers were changed by the military along the entire shoreline of Elliott Bay during World War Two, Pier 70 was numbered Pier 14 – as we see it here, again from off-shore. The roofline of some structures on the horizon are the same as those that appear in the earlier scene. The signs that faced shipping broadcast names that were long familiar ones for Pier 14/70 – Ainsworth and Dunn (barely readable at the top of this west facade), the Blue Funnel Line, and the Dodwell Dock and Warehouse Company. I enjoyed reading this entry about Pier 70, as I am the grand child of Helen Ainsworth. I remember getting letters from my grandmother on Pier 70 letterhead when I was young (usually with a check so I guess it did okay)… I don’t know the year they sold, but word was in our family that my grandmother came up with the concept to make it a retail space in the 70s. In the late 90’s, I worked across the street at Real, and could look over at the Pier. In the hey day of the dot com era, Go2Net turned it into high tech offices–I’ve often thought it would be interesting to learn alot more about the history of the pier as it seems to continually evolve with the changing economic times of Seattle. Would love to know more about your sources so I could read more. Thanks for writing about it! I was the disk jockey at pier 70 chowder house in the 80s and 90s. Was some real good times. It just doesnt look the same anymore. Wow, I met my husband at Pier 70 club back in 1993 and got married and we are still together. My husband and I used to host Sunday reggae night. I moved far away from Seattle now, but it is still a great memory. In the 70s I remembered it as a night spot(dance and shows)and retails shops…. That’s what I remember… night spot and retail shops. I can’t remember the name of the night spot but the house band was Burgundy Express. Chowder house was the name, they never had a house band but Burgundy express played there from time to time as did boy toy and shotz, dan reed network and a host of others. Being the DJ there i got to see em all.